Oppenheim, the leading authority on international law in the UK at the beginning of this century, viewed that – wrong, committed by nationals of a State, is a matter exclusively within their domestic jurisdictions and the biggest disadvantage of it being many governments seeking shelter under such a doctrine and hiding their actions behind the cloak of national sovereignty. For the Developing Countries, there are two main categories of Human Rights- Traditional approach of Western Democracies gives more importance to civil, political on one hand and on the other, developing States specifically exhibiting concern for economic, social and cultural rights. Hence, inter-relate them. International Human Rights law codifies Human Rights, such as the right to life, the right to freedom of thought and expression and the right to health and housing in various international treaties. 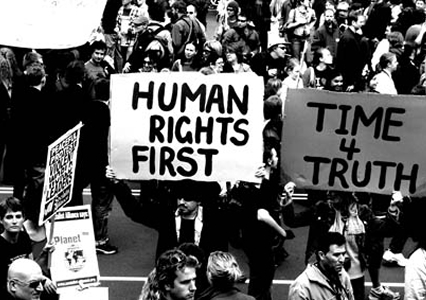 Human Rights are inalienable and indivisible, except in specific situations and according to due process; principle of non-discrimination, which is present in all the major Human Rights treaties, is complemented by the principle of equality; Human Rights entails both rights and obligations, i.e. to respect means that States must refrain from interfering with the enjoyment of Human Rights; high degree of participation by communities, civil society, minorities, women, young people, indigenous peoples and other identified groups. The UN bodies and representatives deal with the enforcement of international Human Rights law through UN Human Rights Treaty Bodies (quasi- judicial courts-implementation of the ICCPR, CAT) and the UN HRC. The UNHRC became the successor to the UNCHR (United Nations Commission On Human Rights) on 15 March 2006, since CHR which had been heavily criticized for allowing countries with poor HR records to be members, such as Sudan, China, Cuba and Zimbabwe. Human Rights is not directly regulated by international law; they’re implemented by the State in the light of its socio-economic advancement. Hence, after 1980s the 3rd world war view was taken as to- concern with the equality and sovereignty of states and according to which the basic rule of international law providing that the states have no right to encroach upon the preserve of the states as well as socio and economic rights. But exception to the above basic rule being the right of humanitarian intervention in exceptional circumstances to avoid a humanitarian catastrophe, by using military action. There have been innumerable Human Rights abuses namely the Kosovo Crisis (1989-99), where the NATO justified the air bombing on Kosovo (initially without UN authorization), designed to support diplomatic efforts to make the Milosevic (Serbian leader Slobodan Milosevic) regime withdraw forces from Kosovo, and cooperate in bringing an end to the violence spread by Serbian military and police forces versus Kosovar Albanian forces and facilitate the return of refugees to their homes; the Israeli-Palestinian conflict (around 2006-07), where humanitarian law violations committed by Israeli and Palestinian armed groups were inquired upon by Human Rights Watch; the Israeli-Lebanese conflict (2006), where Israel was alleged with systematic planning targeting and killing Lebanese civilians which was inquired upon by UNHRC. HRC, an inter-governmental body within the UN system, established for the purpose of international promotion and protection of Human Rights, but many a times it has failed to do so by involving nations committing human rights abuses like, China, Russia, Saudi Arabia, Vietnam, etc. But it has been, on the other side, successful in solving issues like Kosovo Crisis, Israeli- Palestinian/ Lebanese conflicts, Cuban Conflict, etc. The Complaint Procedure which allows individuals and organizations to bring human rights violations to the attention of the Council. National human rights institutions may serve as effective means of addressing individual human rights violations. Individuals or groups of persons may file petitions with HRC against individual perpetrators too, by following HRC Complaint Procedure. And they have helped HRC to achieve its objectives in various conflicts and wars as discussed above.